# 223 Mystery Train & I Forgot to Remember to Forget. 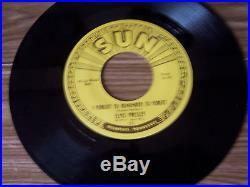 Record is MINT-, NO chips, marks, writing or stickers, only a couple of faint feather scratches. TRAIL OFF #'S 45-U-156 20 45-U-157 20. The number 20 is 1/2 away from x on the mystery train side. Original brown paper baggy included. 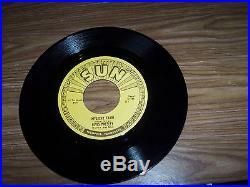 Elvis made 5 records on the SUN label. The first 4 had the 3 push marks on the label. Mystery train, the 5th did not have the push marks. 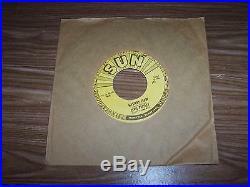 The item "ELVIS PRESLEY ORIGINAL SUN RECORD & SUN SLEEVE #223 MYSTERY TRAIN MINT" is in sale since Thursday, April 28, 2016.